For every 100m of altitude, the temperature drops about 1 degree. The summit of Mt Donna Buang (20 minute drive) is 1250m. The altitude of the Motel is 150m. So... at any given time the Motel (and Warburton) is 11 degrees warmer than the mountain! The below photo was taken in the Motel garden, and on the mountain, 30 minutes apart. The following “FREQUENTLY ASKED QUESTIONS” for snow play on Mt Donna Buang were prepared by Visit Warburton / Warburton Valley CEDA (edited to provide Motel context). 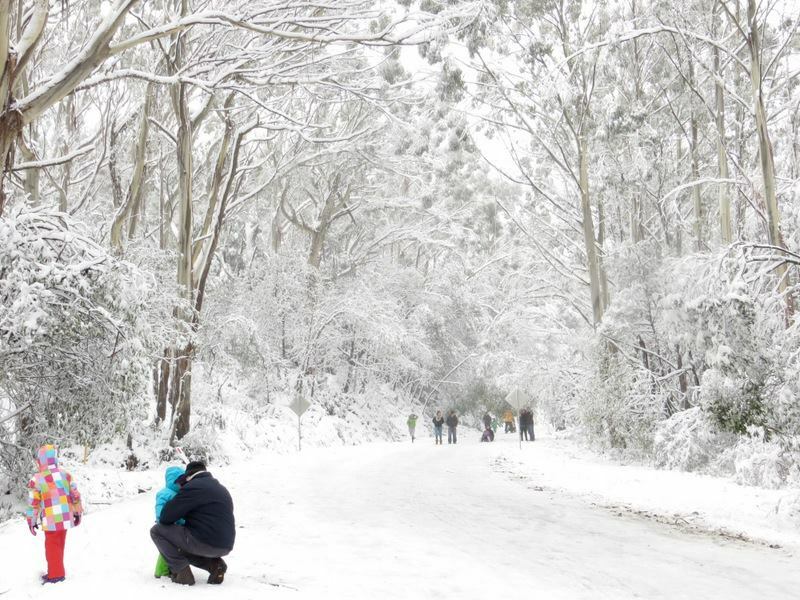 · Mt Donna Buang is 1250 metres above sea level. Snow falls during the winter only. · Mt Donna Buang is approx. 70 kilometres from Melbourne CBD. · The closest town is Warburton, which is located at the base of the mountain. · There is no cost to access the mountain. How long does it take to get up the mountain? Mt Donna Buang Rd is approx. 17 kilometres to the summit. Access is only via Warburton Highway. It takes about 20 minutes to drive up from Warburton Motel if there are no delays. The return drive is via the same road. It is a single lane carriageway in both directions. The road is winding and tree debris is common, especially when it’s windy. Care should be taken in both directions. How safe is it to drive? All drivers should be patient, cautious and drive to conditions. The grader generally clears the road by about 11 am every morning when there have been fresh falls overnight. Many people like the added securing of carrying chains but generally they are not needed on a graded road. Chain hire should be arranged before you get to Warburton. There are no signs indicating when to fit chains as the snow line varies according to conditions. It is not mandatory to carry chains. Please do be aware that there are regular reports of black ice and road conditions will change with additional falls and changes in weather and this may mean chains are advisable. Make informed choices and drive slowly and smoothly. It is not recommended to drive the mountain at night time. Please note: CONDITONS CAN CHANGE QUICKLY. PLEASE FOLLOW THE DIRECTION OF PARKS VIC AND EMERGENCY SERVICES AT ALL TIMES. A digital noticeboard will be set up on the main street in Warburton during peak season to advise of conditions on the mountain, travel times and other important information. Please check this sign and also the aforementioned Facebook page for updates. Are there any other roads to get there? There is no public transport up the mountain. You can only catch a train or bus from Lilydale Train Station to Warburton. Dogs and other domestic animals are not allowed on the mountain as it is a National Park. At the summit you will find picnic facilities, BBQs and some shelter. The Observation Tower is a popular destination all year round. There are public toilets (accessible) and several toboggan runs. Yes, there are toboggans for hire at the summit. Hire starts at $10 per hour on a Sunday, with longer hire periods on other days depending on demand. Can You Buy Food and Drink on the Mountain? Yes, there is a food van at the summit selling hot food, coffee and beverages during peak periods. You can also buy food in Warburton to take up with you from one of the many cafes, or the supermarket. Toilets can be found at the summit, at Ten Mile Carpark, and in several locations in Warburton (Recreational reserve, Mayer Bridge, children’s playground on main street, The Waterwheel Centre). There are large car parks at the summit. Another car park is located at Ten Mile car park (which is a two kilometre walk up to the summit). The Ten Mile location is also a good spot for snow play if you don’t want to go all the way to the top. No. Access to the mountain and parking is free. Is There Accommodation on the Mountain? No, the closet accommodation is Warburton Motel at the start of Donna Buang Rd (at the base of the mountain). Mt Donna Buang is a National Park and therefor home to a diverse range of flora and many types of animal and birds. Depending on the season and conditions you are likely to see lyrebirds and wallabies. There is a naturally running spring at the Ten Mile car park where spring water can be collected. The water is regularly tested by Parks Victoria and is turned off if reports indicate the water is not safe for drinking. This can happen for a variety of reasons and service will be returned when possible. There are several walking tacks including a 1 km vertical climb up the mountain from Warburton. Many walks may not be suitable in winter or other adverse conditions. Maps and information can be obtained from the Waterwheel Visitor Information Centre or Motel Reception. If you have more questions drop in to the Waterwheel Visitor Information Centre between 10am and 4pm daily or phone them on 03 5966 9600. We can also assist guests with information at the Motel.